This morning we launched dsIDXpress Pro, a new IDX option for WordPress real estate websites. The new Pro version of dsIDXpress adds more widgets, better search and user registration to our existing plugin to create a full lead capture IDX solution for WordPress. 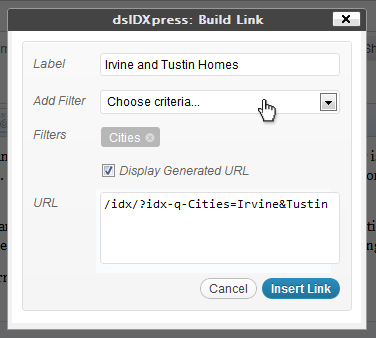 REALTORs looking for a WordPress IDX plugin now have two options: dsIDXpress and our new dsIDXpress Pro. Both options add fully indexable MLS listings on your domain, property search widgets and the ability to integrate IDX data directly into blog posts and site pages – but our new Pro version includes user registration and the latest IDX search features. New advanced IDX search formNow visitors have more control over their search from more places on your site. A new search bar lets buyers build or modify a search from the top of any search result page or city page. Buyers can input basic search criteria like city, beds, baths and price – or they can click “Show more filters” to truly fine-tune their search with foreclosure and price drop filtering, open house search and more. We’ve even included a new consolidated “Location” box that accepts cities, communities and ZIP codes. dsIDXpress Pro (finally) adds user registration to WordPress IDX. Now visitors can create a user account from any IDX listing or search page to mark their favorite listings, save their searches and get new listing updates via email. New buttons to “Save To Favorites,” “Save Search” and “Login” prompt visitors to create a new account – or you can even force users to register. Visitors can be forced to register before viewing certain details (such as days on market) or after they’ve made a number of searches or viewed a number of listings. You decide if/when users will be forced to sign up. All registered user information is emailed to you immediately, providing ‘round the clock lead generation. As part of our updated listing page design we’ve added new prominent “Request More Info” and “Schedule A Showing” buttons to help capture leads. Oversized and placed at the top of each listing page, these buttons load a contact form that collects lead information and emails it to you. Now that visitors can register and create a user account, we’ve added new admin buttons to all IDX pages. Users can log in and log out, edit their contact info and email settings, and view or modify their saved searches and favorite listings. Listing pages have received a major overhaul. We’ve highlighted the most important data points (including price, beds and baths), increased the size of our listing photo slideshow and reorganized additional listing details to make it easy for buyers to easily scan and browse the most dense listing detail pages. 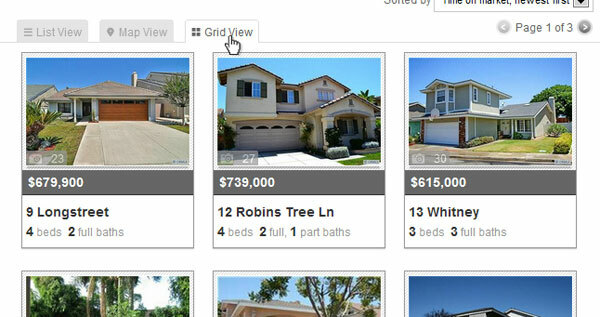 Our grid view adds another way homebuyers can view and sort their IDX search results. When buyers perform a search or land on a search results page, they can browse through matching properties using a list, a map view or with oversize listings photos of our new grid view. Buyers can now search homes on your site using an interactive, Google Maps-based search widget. Available for use in your WordPress sidebar(s), our map search widget lets users input a price range, beds, baths and home size, then pan or zoom the map to set the location. Search results are plotted on the map, and users can click a listing marker to see additional details. A new open house widget offers a slideshow of listings with upcoming open houses. Buyers can browse photos and details of each listing – including the open house date and time – and click to view detailed open house info and a full listing description. A fully interactive gallery slider lets buyers browse through several IDX photos at a time. Users can shuffle through multiple listings at a time, and once they find a property they like, they can click to browse all available photos for that listing. Give buyers a glimpse into the recent market activity for an area with our recently sold widget. Display a list of recently closed sales, including the address, beds, baths and other basic info for each listing – and the sold date and price. A new link builder button in your WP admin lets you create links to custom, pre-filtered search result pages on the fly. Anytime you’re editing a post or page on your site, simply click to build a custom search that visitors can link to from your content. We’ve added new filters to give you more control over embedding IDX listings in your blog posts. Now when you display a set of listings using dsIDXpress shortcode, you can filter by year built, home size, listing status and more. New SEO settings help you improve rankings for your target areas. Whether your site targets all of “Los Angeles County Real Estate” or a more specific area like “Irvine community of Woodbury Real Estate,” you can customize your meta tags and page titles with the city, community or county level you are targeting. We’ve added additional filters in your WordPress admin that let you specify which types of listings appear on your site. Now you can display only listings in particular cities, remove out-of-state listings, only show certain property types and more. We’ll still offer our basic dsIDXpress product for $29.95 per month (plus $99.95 setup and any MLS fees), and it will continue to be a reliable, easy and affordable way to add indexable listings to your WordPress site. We improved the listing page layout and added a cool new link builder option, but otherwise dsIDXpress is staying the same. If you’re looking to add listings and lead capture to WordPress, our new dsIDXpress Pro plugin is available for $59.95 per month (plus $99.95 setup and any MLS fees). Pro includes all the features of the basic version of dsIDXpress, plus the new features outlined above. If you’re already paying $29.95 per month for dsIDXpress, you can upgrade to the Pro version for $30 more per month. That’s a total of $59.95 per month, and there’s no additional setup fee. Upgrading to Pro is simple. Any existing dsIDXpress listing shortcode snippets, search widgets and custom links on your site will continue to work after you upgrade. New user registration buttons will automatically load on your existing listings, visitors will see new search menu and display options on your existing pages, plus now you’ll have new IDX widgets and settings you’ll want to take advantage of in your WP admin. Two and half years ago we introduced dsIDXpress and revolutionized how agents use IDX with WordPress, and we’re excited to do it again with dsIDXpress Pro. Visit our IDX plugin page to sign up for a free trial account or to read more about our options – or simply call us to upgrade or get started with dsIDXpress for the first time. Do you still need SearchAgent to create true custom links or will this system do that now? You’ll still need SearchAgent to create links that have locked criteria, a locked map, excluded areas, separate Google Analytics tracking, and the ability to edit all your links in one place. dsIDXpress Pro uses the same link structure format we offer with the existing dsIDXpress product http://wiki.diversesolutions.com/wiki:link-structure – the difference is 1) there are more filters now available (including solds, open houses, etc), and 2) we’ve added a new tool that makes it easier to build custom filtered links. The end result is the same — it just spits out a URL like this: yoursite.com/idx/beds=4&baths=2&openhouses=yes — only Pro gives you more filters to choose from, and makes it easier to “build” the URLs. …SearchAgent on the otherhand saves all your criteria (including the map location, locked filters, etc) in our system and spits out a static URL like: idx.diversesolutions.com/link/1234 — so you can track and edit that link from your admin and it will automatically update the results everywhere you are using it. So we now have to pay $60 a month for the features that come with a $10 Zillow Agent site? And we still have to pay $100 for map features and the ability to create true custom links? We have to pay $160 a month? Sorry, you lost me. Guess I am going to have to find another IDX service. Sorry but you are on the wrong business nick & dime Matt!! So I am supposed to be ok with being taken advantage of because I am in real estate? I don’t think so. I have to create my own site and do a lot of work to keep it going. This move by DS is a sign that they are intentionally breaking these features apart to try to force me to upgrade services. There are plenty of other providers though. If they are going to do this they are simply going to lose a lot of customers. They won’t be getting any more of my nicks once I find a suitable replacement. I am appalled that they did this. With three products already – Zillow monthly, IDXpress and DSsearch – this is a big fat slap in the face to those of us who have been loyal to the suite of products. Really? Add more money to get features I have for “free” on the worthless Zillow site? 100% with you. And with the Zillow buyout they won’t even talk to us directly like they used to. Everything is filtered through Human Resources first. I talk with Diverse Solutions tech support every week, no human resources, wow, this is so off base. They can’t talk straight about upcoming features because they are publicly traded. Sorry for confusion – example I gave above was a fake string… I just wanted to show how you could add items one after another to your URL. Thank you. FYI – I called support last week and they told me this wasn’t possible despite several mentions of it on your webpages. Is it possible for existing users to try out the upgraded features? At this point, you can either sign up for a free trial account and activate it on a second domain – or contact our sales dept and upgrade your existing account. These are great new features for the WordPress product. Seems like there should be a pricing break for those who also have dsSearchAgent since many of the features overlap (registration, etc). I would seriously consider dropping dsSearchAgent altogether, but since I have such a huge investment in setting up links which are used by dsIDXpress, looks like I’m stuck. Holy cow, this blows my skirt up. SO WORTH THE WAIT!!!! I prefer using both products. The map is a great way to show properties. I combine the map with the seo friendly idxpress for the best of both worlds. You guys are the leader in this industry for all the above reasons. And tech support is wonderful to work with :). Is the new Gallery View a sidebar widget or will it be available in posts and pages? Also, any training on the IDX PRO in the near future? Right now the gallery view is just for your sidebar – but fingers crossed we can make it available in some capacity for pages/posts in the future. We will be offering webinars covering dsIDXpress Pro soon – – we’ll post here when they are ready. In the meantime, email, call, or visit http://forum.diversesolutions.com for help. So, if we pre-paid for a year of dsSearchAgent and want to back out, can we? Sorry, you’d need to check with our sales dept on that. Generally our annual contracts are non-refundable — but sometimes they can work something out for clients moving to another product. Would still love to see a related listings or similar homes feature displayed on individual listing pages. Any talk of this? dsIDXpress Pro includes this feature — I just missed it in this blog post. At the bottom of each listing page we include a list of similar active and similar sold listings (if available). So disappointing! Being with DS for years, this is a huge letdown simply because the original plugin should have had a lead generation component. The hook of the original plugin was that it was indexable but had no way of capturing leads. Now that the new plugin has lead generation, we get a 100% price increase. Knowing that the new plugin was in the works, I feel like I am being punished for being a loyal customer (SearchAgent & IDXpress). Now what? 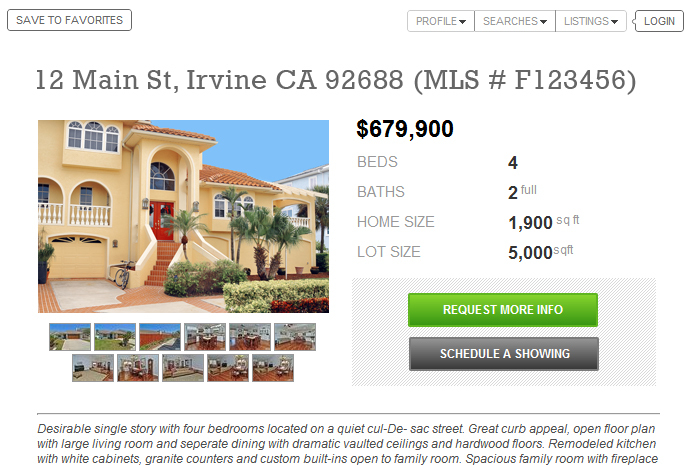 Do I drop my paid Zillow ads or get an upgraded IDX plugin? These are fantastic new features! I had hoped we would see many of these come through eventually. Just curious though, why were they not just introduced as an upgrade to the existing idxPress and the price left alone? I love DS and have been with you all for a long time, but things are competitive out there. I hoped you would provide more value for the same price rather than ramp prices up, especially a 100% increase?? Just ordered it. Looking forward to implementing it. A hugely effective feature would also be a 404 redirect to a page of similar listings in a zip code as subject property for listing landing pages that go off market but still have pages indexed on google. That in the works? Have had numerous issues with this “pro” package. Almost all of the features mentioned cannot access. You would think there would have been some testing before releasing. Will they have a facebook login so the buyers will not have to enter their information, just click login with facebook? There’s a huge hole of opportunity here…when the listing is no longer available there should be some kind of form to allow those searching to inquire if the home is still available. If it isn’t this is an opportunity to find another possible property for the buyer. Besides which, it’s pretty rare the home the buyer is inquiring about is even something they’re going to buy. Typically they pick something else. Sending this traffic to a blank page with a 404 error I think is a huge mistake. Although that would be nice to have it from DS you can use a 404 start plugin and return your own soft page. I have a few buttons and then the DS search as a soft 404 page. Is there a trial version of Pro available? I’m only able to setup the standard features with the trial. Newport Beach, all of which are in Southern California. You guys need to connect the gallery view widget to custom search modules from DS Search Agent. FYI… upgraded to the PRO last week for the extra features expecting that all pages would have the new call-to-action buttons and new layout. WRONG! If you do a single MLS post/page.. you get the old layout with NO call-to-action. The sales department does not know this! After installing and re-installing, clearing cache, and multiple phone calls I’ve been told it was a design feature. I highlight my listings, one listing on a page and was excited that I would have a call to action and updated layout. I’ve asked that with the extra $30/month with get the layout on ALL pages.. shouldn’t be that hard…. Can someone please replay to Jconley’s concern? I use the single listing feature quite a bit but if the pro features are not available there then that seems to make it much less worthwhile to pay extra for an upgrade. “I previously explained (NOT) that the “Insert Single Listing” via short-code does not show the new dsIDXpress layout, unless the full details of the listing is viewed. 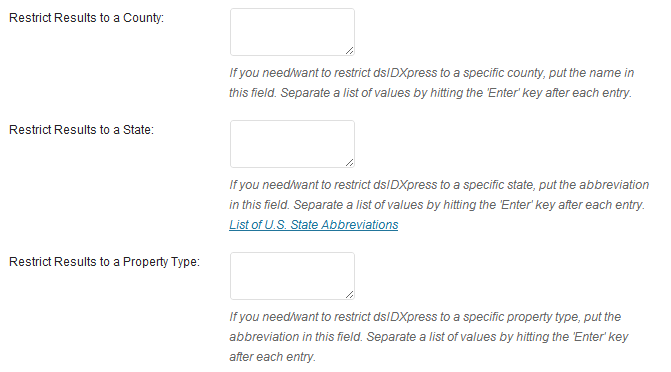 If you use the “Insert Single Listing” option, it will display the listing like the normal dsIDXpress, but there is an option to “View full details” of the listing and once you go to the full details view, that is where the contact form and new layout is displayed. I have just logged in for the first time to see the upgrades. OMG!!! For those of us that have struggled with making the quick search look nice, that piece alone is unbelievable. But now we have open houses, statistics and more to work with. I personally am thrilled to see so many powerful new tools to work with. I will post a new custom site we are working on with all these bells and whistles. Thank you DS. I would like to check out the product in detail. I’ve looked on the DS Community Forum and can’t find any demo sites/etc to see the plug-in in action. I don’t plan on experimenting with my live site. Robert – where should we go to see a working site? Thanks Bruce–I signed up for a free trial and it wants me to check it out on my blog, which I don’t want to do–plus the trial does not reference PRO anyway, it is just labeled as IDX regular. I sure would like to see a working site as well but the customer service people don;t seem to know much about the product. That’s what it looks like after a search has been performed. 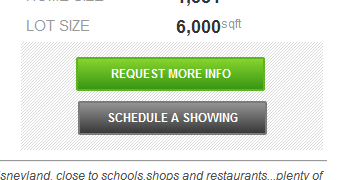 And if you click into a listing you’ll see the new layout for the property details pages as well. Unfortunately, you are correct. The single listing tool as well as posting multiple listings using the short code… those DO still use the old format. We were not able to get short codes to use the new format in this release. It may be something we are able to change down the road, though. We definitely understand your concern about this and our Dev Team will definitely consider changes to how the short codes function in the future. We do appreciate your comments, guys! Lindsay – This product launch has been a disaster in so many ways. The only way for an existing customer to understand the product is to pay for the upgrade and then figure out what PRO does or doesn’t do. And from what I can tell, customer engagement is limited to comments on this blog post, and a tech group on Facebook. With all of the questions and surprises about functionality and pricing, I’m sure that most existing customers will be sitting out this upgrade until you guys can get your act together. I know that I will. Hi Bruce. Care to share the facebook link? We do have a couple of open tickets regarding the new dsSearchAgent modules (stats / open house / etc). We’re hoping to have those issues resolved for everyone soon. We also have a ticket with our Dev Team regarding being able to use custom links with the new modules. We hope to have more news on that soon for you. Unfortunately, you are correct regarding the grid view not being a part of short codes. That may be something we change down the road but for now the short codes do not include those additional views. We appreciate your comments, Bruce, and we are definitely listening here, on Facebook, as well as the calls and emails we are receiving. We definitely did encounter bugs with this new upgrade. While we did do extensive beta testing prior to its release it’s clear we did miss some ‘scenarios’ that have made life since the release… interesting. There is never a guarantee that there will be zero bugs when a new product is released (anyone ever purchase a new iPhone when it’s first released?) because it’s virtually impossible to imagine every possible scenario that can occur. That said, we all have learned a lot from this release. And future product releases will go much more smoothly as a result. We appreciate everyone’s patience as we worth through the remaining issues and continue to welcome your comments and concerns. We’re listening, guys! Lindsay – I’m sure you’ll work out of the bugs. DS has a great technical team — I don’t think there’s ever been a doubt about that (at least not with me). From my perspective, core issues aren’t with bugs; but are the result of a very poorly executed deployment. The scope of the upgrade still isn’t clear. The only way for current customers to understand what’s there is to take the upgrade, double your IDX charges, and then experiment with your production website. Enough said. DS is an important part of my site. I’ll watch from the sidelines for now. I’m hopeful that these product issues will be worked-out. We do have a dsIDXpress Pro key you can use that uses our test data. That would give you a good idea of how the new plugin functions and the new features you gain in the admin as well as the live features that your website visitors can engage. That said, you can also upgrade whenever you like and if you are not satisfied within the first 30 days you can receive a refund on the upgrade. And of course, since there is no contract with dsIDXpress Lite or Pro you can cancel either of those at any time. I’m glad you have faith in us, Bruce! 🙂 We have worked through many issues already and there are few left to handle. What a great response Lindsay. I work with all the major idx companies and Diverse Solutions is my favorite. Their customer support is hands down the best. I am seeing a few hiccups too, but know that DS will have this fixed pronto. wow, 100% increase in price? I will keep my eyes open for a new product. Hi! I’d like to have the demo for dsIDXpress PRO. Is that possible? Please let me know! Need more help. Where can I see all IDX PRO widgets working? Sorry, Anna – we don’t have a go-to site to showcase all the widgets. Most clients customize the widgets so the content fits pretty seamlessly into their website – so we have thumbnail photos of each of them here: http://www.diversesolutions.com/product/ds-idxpress/tour/widgets and we have the full working demo accounts that let you setup and customize any of the widgets on your WordPress site – but we don’t have a single depository or website to refer you to in order to see all the options in one place. Alternatively, you can call or email our sales department for URLs to websites using specific widgets you wanted to see in action, or they can show you how to use your demo account to setup specific widgets to try on your site. where are the leads stored with DS IDXpress pro?